NEW YORK: Bon Jovi's Richie Sambora has dropped out of the current leg of the rock band's tour because of "personal issues," but the guitarist, who has done stints in rehab for problems with alcohol, tweeted fans on Wednesday that he was "well." 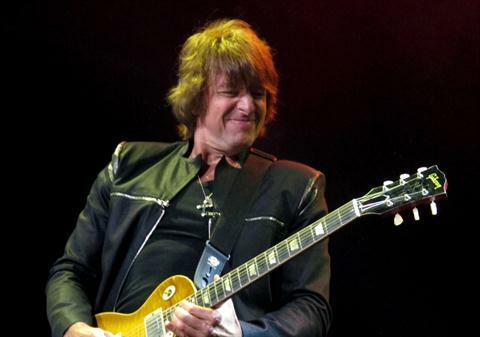 "Thank you everyone for your concern," Sambora said on Twitter. "I'm well, but had to stay in LA to take care of a personal matter. Love you all and see you very soon." Sambora, 53, who spent time in rehab in 2007 and 2011 for alcohol and prescription drug abuse, was not included at Bon Jovi's performance in Calgary, Alberta, on Tuesday and the band said he would miss a run of North America concerts. "Due to personal issues, Richie Sambora will not be performing on this upcoming leg. All shows will go on as scheduled," said a statement on the band's website on Wednesday, offering no other details or when Sambora might resume performing. Sambora also missed Bon Jovi's 2011 North American and European tours. Celebrity website TMZ.com, citing unnamed sources connected to the band, said Sambora's absence was due to long-running tension between the guitarist and singer Jon Bon Jovi. Bon Jovi is scheduled to perform this week in Edmonton, Alberta, and Winnipeg, Manitoba, and St. Paul, Minnesota, on Sunday. The band is set to play in Sweden, Germany, Britain, Spain, Poland and Italy before returning to the United States in July. What's up, yes this article is in fact nice and I have learned lot of things from it on the topic of blogging. thanks. Actually when someone doesn't know afterward its up to other visitors that they will help, so here it occurs.